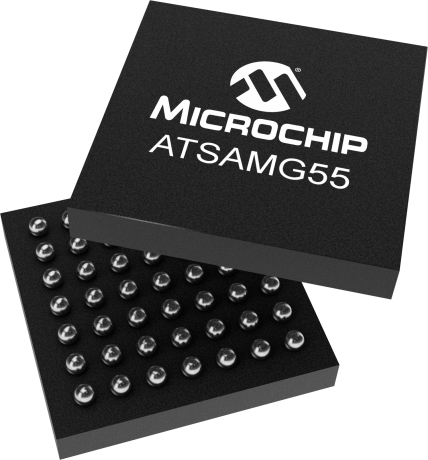 The Microchip's SAM G55 embeds a Cortex-M4 CPU with an FPU (floating point unit). This ensures maximum throughput. This is very important as it allows you to minimize the active power consumption and get to sleep faster in order to reduce the overall power consumption. Additionally, the devices have 30 DMA channels, which give extremely high throughput. The combination of ultra-low power consumption, fast wake-up time and high throughput is what gives the SAM G the edge in space- and power-constrained consumer applications such as sensor hubs. It wakes up quickly, has the throughput needed to reduce the amount of time spent in active mode, and then goes back to sleep with SRAM retention to conserve energy. This gives the best performance and longest battery lifetime. It is fully-functional all the way down to 1.6V; including flash reads and writes, as well as full ADC operation. This allows for a more flexible power supply scheme that will squeeze extra runtime out of a battery. The SAM G55 Xplained Pro evaluation kit is ideal for evaluation and prototyping with the SAM G55 Cortex®-M4 processor-based microcontrollers. Extension boards to the SAM G55 Xplained Pro can be purchased individually. The ATSAMG55-XPRO evaluation kit does not include extension boards.